In the wake of news that the Hawks could be looking at a couple weeks without Patrick Sharp, many fans are starting to jump off the bandwagon. As Lee Corso says every Saturday in the fall: Not so fast! 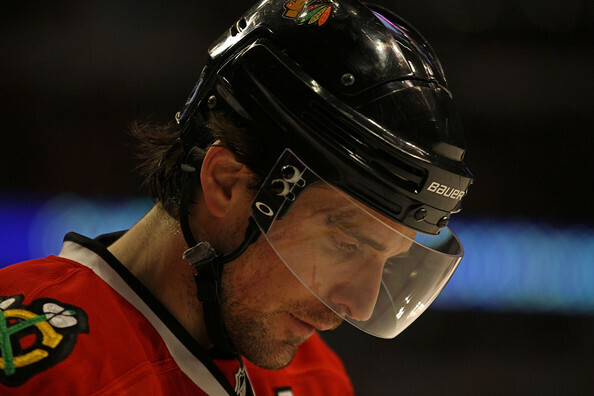 Patrick Sharp had scored one goal in his previous nine games. In nine games in March, Sharp has 10 points (one goal, nine assists). However, those numbers are more generous than he had been producing; he had four of those nine assists in one game. Since February 1, Sharp had only four power play points (registered in three games). That’s a span of 22 games in which he had been a productive special teams player on only three occasions. Dave Bolland had scored only three goals in his last 16 games before going down with a concussion. These numbers are not presented in any way to diminish the production of the team’s leading goal scorer and an important center, but both Sharp and Bolland had been struggling before getting hurt. Marian Hossa has 10 goals and 11 assists (21 points) in 21 games since the beginning of February. He has registered at least one point in 11 of his last 13 games. Patrick Kane has 11 goals and 15 assists (26 points) and is plus-11 in 21 games since the beginning of February. He has at least one point in 11 of his last 15 games. Ryan Johnson and Jake Dowell are both excelling in faceoffs, something that had been an issue for much of the season. In March, Johnson is winning 68.3 percent of his draws while Dowell is winning 55.6 percent of his. Five different Blackhawks have accounted for the team’s five game-winning goals in March. While Jonathan Toews is an expected name to see on the list, it isn’t likely that the following would have been mentioned as possible winners: Bolland, Johnson, Chris Campoli and Viktor Stalberg. The PK is getting dramatically better. In March, the Blackhawks have killed 19 of 22 power plays, an 86.2 kill percentage. While there are concerns about the PK without Bolland, the Hawks have killed 8 of 10 power plays (80 percent) in the four games since he went down. The Blackhawks are the #1 scoring team in the NHL since the All Star Break (3.41 goals per game). These scoring and special teams numbers are being accomplished despite Brian Campbell skating only 7:05 in the last five games. Fans have begged the big name stars to step up, and the response has been strong. Hossa and Kane have been scoring at an elite level on separate lines, and Toews has only been mentioned once. Fans worry about there being no depth, but all of these crucial parts of the game – special teams, faceoffs, game-winning goals – are being brought to the table by secondary players. And fans worry about the Blackhawks being able to win games. While key players have been hurting all year, the Blackhawks have been able to maintain their position in the thick of the Western Conference playoff race and are still in a strong place. The wild card is who will step up as the games continue to be played. But so far, someone has stepped up almost every night.